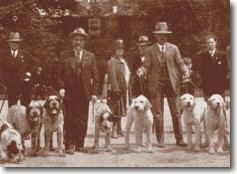 The association for the protection of the Spinone breed in Italy is called C.I.Sp. (Club Italian Spinoni) derived from the Ex Family of the Spinone (Club of Spinone enthusiasts for the protection and improvement of the breed) and was founded in 1949 by Dr. Paolo Brianzi and Dr. Ezio Caraffini. 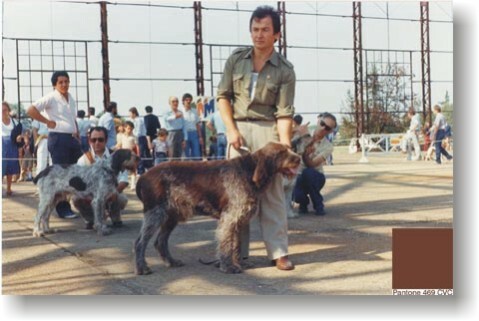 The C.I.Sp., besides organizing shows of a high level, all of which are dedicated to the evaluation of the Hunting and Morphological aspects of the Breed, puts much effort into the preparation of the Spinone Yearbook in which, besides greetings to the President and reporting the results of all the shows that have taken place throughout the year, also reports the association rules and (Morphological and Work) Standards of the Spinone. this difference, unfortunately, gives rise to embarrassment and confusion among the Spinone enthusiasts. Pag. 2 of 7, paragraph 1. Skull and Head. Oval-shaped skull- its lateral walls gently sloping like a roof, with very well developed occipital protuberance and parietal crest very pronounced. The bulge of the forehead is not very developed, not towards the front or in height; the superciliary arches are not too prominent, the stop is barely marked, whereas the medial frontal furrow is very pronounced. They are large, well open and set well apart, the eye is round; the lids closely fitting the eye which is neither protruding or deep set. They tend to be on the same frontal plane. The iris is of an ochre colour, more or less dark according to the colour of the coat. Dolichocephaic-long-headed. The direction of the longitudinal superior axes of the skull and muzzle are diverging, the stop is absent. Oval-shaped skull- its lateral walls gently sloping like a roof, with very well developed occipital protuberance and parietal crest barely marked. The cheeks are lean. The bulge of the forehead is very developed, towards the front and in height; the superciliary arches are not too prominent, the stop is barely marked, whereas the medial frontal furrow is less pronounced. - Eyes: they are big, well open and set well apart, they are round. The eye is neither protruding or deep set, the eyelids closely fitting in a semi lateral position. The colour of the iris must be ochre, more or less dark according to the colour of the coat. It is clear that in the underlined words there are differences that create confusion and need to be verified. Because those reported by the Club have been modified deliberately, it isnà¡ question of typing errors, and therefore are not correct as far as breeding planned and aimed at the improvement of the race is concerned. A head with a very pronounced parietal crest and with eyes on the same frontal plane constitute an unmistakable trait of the Spinone and this particular feature is easily noted even from a distance. On the contrary, a head like the one described in the the C.I.Sp Standard will be less typical and very similar to that of the Italian Bracco, which has its eyes in a semi-lateral position, a barely perceptible parietal crest . I remember that during a C.I.Sp meeting, at which I was present, a leading judge, whom I esteem greatly, describing the head of a Spinone, expressed himself thus: "I would like to see a touch more parietal crest ä¨©s was meant to say that a more pronounced crest would have given that Spinone a more characteristic trait. I have attached some photos of Spinone in which it can be observed that the parietal crest is of great importance and, the eyes on the same frontal plane, that are big, well open, round and of the correct colour constitute a great part of its unique features for the global evaluation of the Spinone. I have also attached a photo of a female pup at the age of three months, whose eyes are definitely on the same frontal plane, I hope that the Editor finds the space to insert all the photos by reducing their size if necessary. Roan brown female Spinone , eyes in position decidedly on same frontal plane, Sarah of Subasio at 3 months. Owner Ezio PagliariniBesides the discussion on the important parts of the head there are also two proposals to bring to the attention of the E.N.C.I. Technical Committee and naturally to that of the C.I.Sp., the first concerning size, the second the colour of the coat. With regard to size I would like the proposed reduction to be discussed of the maximum limit for the males from 70 to 65 cm considering that with the 2cm tolerance margin it would still reach 67 cm, leaving the minimum limit unchanged at 60 cm. For the female the reduction from 65 to 60 cm for the maximum and the minimum from 58 to 55 cm. My proposal is not entirely new, in fact, many before me have proposed and adopted these measures, suffice it to read the book (or rather great work) by Ceresoli "The Italian Spinone and the similar races" from which I report some passages knowing that many people don't have this book, which today is out of print, but perhaps the E.N.C.I. could soon surprise us! Stature and weight of the body. Males: from 54-56 cm. and 24-25 Kg. to 64-66 cm. and 34-36 Kg. Females: from 52-54 cm. and 22-23 Kg. to 62-64 cm. and 32- 34 Kg. Admitted, but not preferred, statures up to 63cm. I have reported these measurements to show that today, in the current Standard, while not speaking about light or heavy stature, it gives the possibility however of attaining the same result, Spinoni from 60 to 70 cm, that is with 10 cm gap, as recently seen in the show ring. 60 cm for the male and 55 for the female; adding their preferences for the larger sizes, but not beyond the 65 and 60 cm respectively, these ethnic data will be adopted by the Italian Kennel Club. In 1933 also Brianzi and Ullio after the constitution of the Society Friends of the Spinone give measurements of 55-66 cm for the male and 52-62 for the female, in 1936 these measurements are proposed to the K.C.I.,still in 1936 also Fiorone proposes the measurements 52 to 66 cm. 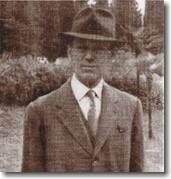 In 1939 we can refer to the Ethnic Data by Solaro, they are certainly the most complete and they are approved of by the E.N.C.I., the measurements are the current ones, but looking at his drawings, one does not have the impression of top-sized spinoni , I believe that, on close observation of the drawing of the roan brown spinone on page 159 of the book, it does not even reach 65 cm. If this proposal is accepted Spinoni will be more homogeneous and not the giants of 70/ 72 cm that have certainly deterred many hunters from Spinone ,either due to the space it would take up in the car or for those who live in flats where space is fundamental, it is, in any case, counter-productive for the breed to see spinoni of maximum and minimum size in the same Ring, as has happened at recent meetings where there has been the impression that not only one breed of spinone exists. I hope that this situation is discussed as soon as possible. As far as colour is concerned, debate centres only around the roan brown variety, it is written that the best shade is the ï®«à¨¡bitÉ have always added that it is right to specify that as the "mendicant friar".In fact the order of the Franciscan monks is divided into more groups and this is the one that must be chosen. The mendicant friar is the person who, for many years, with a wheelbarrow and "mule" travelled around the countryside and collected the donations from the farmers: wheat, must and olive oil for the convent. He said he would pray for them and sometimes to those who smoked he would give some tobacco : this is the monk with the warm coloured habit that is the right shade of roan brown for our spinone. Unfortunately now there is the proposal to return to the origins of Francis when the habits were dark grey and so we wouldnà³¥e the brown anymore but dark grey instead. For this reason I thought I would present a new and definitive interpretation of the colour of the coat of the roan brown spinone. Today PANTONE ã¼¯span> MATCHING SYSTEM is used to define a colour that is the same all over the world, which is a revolutionary method that prevents errors, a system which identifies each colour by its an own number that is identical in Italy, America or elsewhere. For the roan brown Spinone PANTONE ã¼¯span> 469 CVC (see example attached ) is perfect and will be the same all over the world; whoever has a computer that isnà´¯o old could draw a square and will fill it with this colour, anybody that doesn't have a computer will only have to drop by a graphics store and ask for a sample taken from the catalogue of the PANTONE ã¼¯span> MATCHING SYSTEM, as we will all have all the same reference. Pantone ã¼¯span> 469 CVC, colore a tinta calda come la tonaca di Frate Cercatore. Pantone ã¼¯span> Colour 469 CVC, warm shade like that of the Mendicant friarà¨¡bit. In the show ring, anyone will be able to observe a brown roan spinone and compare the colour to their own sample of the PANTONE ã¼¯span> MATCHING SYSTEM and the result will always be the same: PANTONE ã¼¯span> 469 CVC. and so putting an end to any possible dispute. We hope that the roan brown spinone coat will become more and more homogeneous and nearer to this colour. Currently there are too many spinoni with a very dark coat, which doesnì³°an style="mso-spacerun: yes"> suit "human" eye of the spinone. In the colour photo the difference between the mendicant friar habit colour or PANTONE ã¼¯span> 469 CVC and the very dark colour of the spinone in the background can be seen (Dr. Luca Massimino, "neo-graduate" is observing this detail, further back, a University Professor is pointing out the same thing with his right arm). I really hope that this can be discussed , as it would unite the ideas and objectives of spinone enthusiasts, who believe in this breed and, now with the accessibility of Internet and e-mail, people from all over the world are able to communicate. In fact our spinone is not restricted to one nation, nowadays it is known internationally , it is its moment of glory, the Americans adore it, there are requests from every continent: we must then try to forget the bad publicity in the years immediately the after war, when, as Giulio Colombo writes in his book Trialer writes: "The spinone suffered the insult of crossbreeding with other races, Kortals and Boulet, that descend down from him and didn't boast his specific assets." Today the spinone has freed itself from this insult and with the increase of requests, (also in Japan they want the spinone) the increasingly greater interest on the part of hunters to take part in trials with their own spinone, the precious contribution that the E.N.C.I. gives to the Italian breeds and the great commitment of the C.I.Sp. towards ever increasing improvements, all make for a hopefully very important future for the Spinone. The above is meant to be above all an opening towards a discussion group nominated by the E.N.C.I. and by the C.I.Sp. that really deals with the establishment of rules all aimed at the global amelioration of the race, given that today, this breed has made a successful entry into many Countries of the World. By Mr.Solaro approved by the E.N.C.I. Rassegna Cinofila, E.N.C.I., Milan, N. l. 1939. 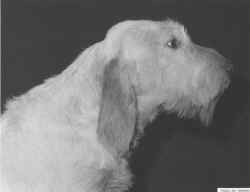 Dog belonging to the group of the italian bracco (according to the classification of Mr.Pierre Megnin). Italian: Senofonte (500 B.C), Grazio Falisco, Nemesiano, Seneca, Arriano already talked about this breed. Selincourt (Le Parfait Chasseur, 1683) says: «les meilleurs griffons viennent d'Italie et du Piemont» (the best griffons come from Italy and from Piemonte). (general appearance, proportions, harmony, aptitudes). The general structure is that of a mesomorfus, temperate (submesomorfus), the trunk is harmonious and square in comparison with the shape and discordant in comparison with the profile. Solid, rustic and vigorous dog. Strong bone structure and well-developed muscles and distinct aptitude towards fast and wide gait. He can hunt on all terrains , in different climates, but especially into the brumble and in the woods. The breed has a docile character, patient and sociable. His physiognomy is intelligent, indicating strenght and courage. Expressive eyes with almost human sweetness. Resistant to tiredness, he can easily enter in the bramble bush and into deep and cold water having a very thick skin layer covered with hard hair. He's known for his instinct as the best retriever and as a really good swimmer. The total length is 4/10 of the height to the withers; the length of the muzzle has to be half of the total length of the head, so that half of the length is over the horizontal line that joins the two internal angles of the eyes. The width of the two skull between the ceek bones doesn’t have to exceed half of the total length of the head, better if less. The skull index doesn’t have to exceed the number 50 and the best would be 45. The direction of the longitudinal axes of the skull and of the muzzle are divergent, in fact, prolonging the superior line of the nose, it has to pass above or tangentially to the occipital apophysis, but never below. Should be on the same line of the nasal bridge spongy, big and with a very big and rounded edge.. Of rosy colour in the whites brighter in the white-orange, brown in the roans and in the browns. In profile the nose protrudes over the forward vertical line of the lips. Slightly straight and hilly. Length: see “Head”. His width measured at half of its length has to be 1/6 of the total length of the head or 1/3 of the length of the nasal bridge. The upper lips are thin and divide under the nose and become round to the anterior extreme, they cover the the lower lips and they show a fold on their labial joint so that the lower profile of the muzzle depends of the profile of the upper lips which have the joint as the lower part of the profile itself. The lateral faces of the muzzle have to be parallel and seen from the front it has to be square. Strong and with the set of the teeth perfectly fit together. Healthy set of the teeth. The branches of the lower jaws have to be slightly curved. The depression of the frontal nose has to be slightly inclined: see “ Skull”. Its length has to be the same as the one of the muzzle and its width (cheek-bones) does not have to exceed half of the total length of the head.See “Head”. Its shape is oval, the occipital apophysis is very developed and the interparietal crest is marked so that the lateral walls of the skull( on their superior border) are slightly inclined and of a convex shape. The lateral walls of the skull softly decline so that the superior line is never flat. The bulge of the forehead are not very developed and slightly escape to the back. The superciliary arches are not too prominen . The eye has to be big and well opened, the inferior eyelid has to tend to the roundness, it has to closely fitting the eyeball and the lower lids does not have to be overtuned. The eyeball doesn’t have to be neither protrudentor deep set. The joining line of the external and internal angles has to be almost horizontal. The colour of the iris is intense yellow in the whites and white-orange; it tends to be ochre in the brown roans. The pigmentation of the eyelids has to be the same of the nose. Triangular shape, the length never exceed 5 cm, the inferior line of the throat has to have a normal position. The width occupies the area that goes from thepoint of insert of the head to the neck until the middle of the zygomatic arch.. The joint of the ear has to be on the uppest part of the zygomatic arches. The ear has to drop adherent to the ceek, never rolled up but slightly turned inwards . It has to be almost constantly relaxed with scarse erectile capacity.The tip of the ear is slightly rounded. The skin is thin and covered with a short and dense hair interpolated by a light scattered hairs that thickens at the edges. Strong and muscular clearly distinguished from the nape of the neck, it is harmoniously merged with the shoulders. Its length is 2/3 of the length of the head and its perimeter is 1/3 of the height at the withers. The throat has to have a light abundance of skin which shows a lightly developed double dewlap. The shoulder has to be strong with muscles and free in the movements. The length has to be ¼ of the height at the withers and with an inclination of 46 - 60 degrees. In comparison with the median plane if the body ,the point of the shoulder-blades are not very close to one another. The arm has to be oblique but it has to be inferior to the one of the shoulder (65 degrees), it is well muscled; its position is almost parallel to the medial axis of the body. The scapular-humerus angle is of 125 degrees with an inclination of the scapula of 60 degrees. A vertical line, strog bone structure; its section is oval. The hind tendon is strong and detached. Its length has to be a little bit more than 1/3 of the height at the withers and exactely 3,54/10 of the height. The height of the whole arm at the elbow is 57% of the height at the withers. The elbows have to be covered by a soft and relaxed skin and they have to be parallel to the median plane of the boby. The point of the elbow has to be perpendicular from the back point of the scapula. It follows the vertical line of the forearm, covered by thin skin with the a prominent bone. They have to be flat forward and backwards and seen in front , they follow the straight line of the forearm. The length doesn’t exceed 2/9 of the length of the elbow arc. Round picked with well adherent fingers between themselves and covered by a short and dense hair even between the fingers. The pads are lean and thick-skinned, the pigmentation depends of the colour of the coat. Nails are strong and curved; in the whites and white-orange the nails could be white or with a light pigmentation. In the roans and in the browns the colour has to be dark but never black. The length of the body is equal to the hight at the withers. Wide and weel opened with well developed chest muscles. Its width has to be the 30% of the height at the withers. The handle of the stern has to be lower than the point of the shoulders and the closer is to the horizontal line of the stern the better. Large and deep going down until the elbow. Its transversal diameter has to gradually decrease until the stern but it never has to be carinate so that the cartilage of the ribs are still convex. The ribs arcs have to be opened; the profile of the sternal area tends to be horizontal. In a spinone of 65 cm (height of the withers) the chest should be: perimeter (behind the elbow) 79 cm; perimeter ( ribs arcs) 69 cm; depth 38 cm; height 26 cm; trasversal diameter 22 cm. So the chest index will be given by a number not exceeding 6, better if lower. Well rounded, oblique, large space between the ribs, long, oblique and well-opened fake ribs. Withers raised on the dorsal line and large because of the points of the shoulder-blades that are well apart.Upper profile of the back is made up of two segments:the first, nearly straight,slopes from the withers to the 11th vertenbra with an inclination of 15 degrees; the other, slightly convex, joins with the solid and well arched lumbar region. The length of the back is 38% of the height at the withers. They follow the second part of the back and they are merged with it, slightly convex, they have well developed muscles in width. Their height is little more than ¼ of the height at the withers. Their width is similar to their length and is like 14,15 to 16. The lower profile of the abdomen (seen from the profile of the stern) ascends towards the hip of few centimeters (maximum 6). The hips have to be almost equal to the length of the renal region. The hollow of the hip has to be minimum. The rump has to be wide, strong and well muscled. The trasversal diameter, between the two hips, has to reach 1/7 of the height at the withers. Its length is 1/3 of the height at the withers, excately the 29% of this height. Its inclination is about 40% on the horizontal so that the rump is a little bit “sunk”. Long, large, muscled with the back border slighyly convex. Its length doesn’t have to be less then 1/3 of the heught at the withers. Its external side (from one border to the other) has to reach ¾ of its length. Its direction is slightly oblique and, in relation with the vertical, it has to be parallel to the medium plane of the body. With strong bone structure, dry muscles in the upper part. The furrow is marked and evident. The length of the leg has a ratio with the thigh of 25 to 23. Its inclination is about 65° below the horizontal. The distance between the the point of the hock and the pads doesn’t have to exceed 3/10 of the height at the withers. Its two faces are never too big. Its angle is opened due to the inclination of the tibia, Seen from the back the line that goes from the hock to the ground must be on the vertical as an extention of the buttock. Strong and dry, its length is given by the hright of thr hock. It has a simple ariculated ram. Well inserter in the rump, thich at the base, it is carriedeither horizontally or down, cutted at about 15-25 cm from the base. The admitted coulors are: white, white orange markings, white speckled with orange, white with brown markings ; white speckled with brown(roan brown) with or without brown markings. Hard, dense slightly rough hair close fitting to the body. Length 4 to 6 cm, shorter on the nasal bridge,ears,the head, the front sodes of the legs and the feet. On the back sides of the legs, the hair is rough brush but never with franges. The hair can be shorter and thinner during the pack of hounds but it never has to prevail the hard hair.Long and stiff hair garnish the eyebrows,part of the ceeks and the lips forming eyelashes, moustache and beard giving the spinone his own typical good-natured expression. Close fitting to the body it must be thick and lean. It covers the body forming two folds which go from the sides of the lower jaws and disappear at the first half of the neck. Whwn the head is carried low one just notice a fold which descends from the outer corner of the eye over the ceeks. The pigmentation of the skin varies according to the colour of the markings. The colour of the external mucous membranes depends of the colour of the coat and they never have to be black or with no pigmentation (disqualifying fault). Male from 60 to 70 cm, females from 58 to 65 cm.Weight : males from 32 to 37 kg, females from 28 to 32 kg. When hunting easy gait and extended fasr trot; during the first moments of the search he can intercalate paces of gallop.